Will wonders never cease? After Instant Pot’s biggest multi-use cooker went on sale yesterday at a price that’s even lower than it was on Black Friday, another surprise Instant Pot sale just popped up on Amazon. 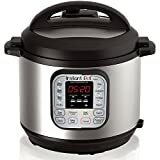 This time around it’s the Instant Pot DUO60 6 Qt 7-in-1 Multi-Use Programmable Pressure Cooker, which just so happens to be the best-selling Instant Pot model on the planet. It retails for $100 but if you hurry you can grab it for just $67.99. So what are you waiting for! ?